Influencer marketing gains more popularity as an opportunity to reach the potential customers in a humble way. This is why today we’ll look through 4 cool influencer campaigns. Each one took a different approach to promotion - guest posting, Instagram, SMM - but each one managed to receive outstanding results. Want to see which ones? See the case studies we’ve got for you! Below are the four examples that prove that it’s worth every minute and effort you invest. On the eve of International Women’s Day in 2017 Microsoft together with National Geographic started a campaign “Make What’s Next”. The campaign was launched to encourage girls to choose tech professions, and show that there are brilliant women behind lots of useful inventions and discoveries. As only 6.7% women get STEM (Science, Technology, Engineering, and Maths) degrees, Microsoft believes it’s vital to inspire girls to take untraveled paths and change the world. 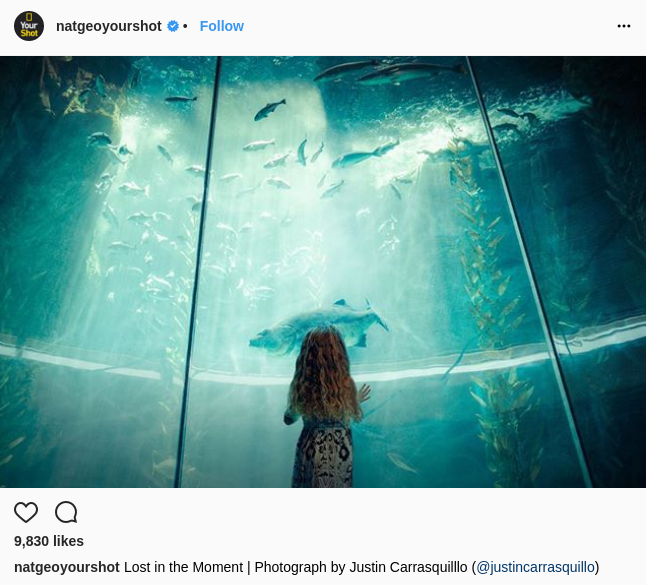 So National Geographic and Microsoft joined their efforts to invite female explorers and photographers to share their stories through storytelling and photographing on Facebook, Youtube, Instagram, and in-person meetings. By collaborating with a social media giant like National Geographic, Microsoft got access to a base of millions of active followers and reached 91 million people during the whole campaign. Being aligned with an international event (Women’s Day) and a trending social question of equality, the campaign demonstrated outstanding results. The campaign worked for many reasons, one of them was the perfect timing - just before the international occasion which drew the eyes of the society. What turned out to be even more impactful were the personal stories. Storytelling works only when it feels real, true and authentic, and this was exactly what Microsoft and National Geographic managed to fulfill by opening their heroines to the world. Just like Microsoft, American Express decided to make use of well-known influencers. Unlike Microsoft, it only concentrated efforts on Instagram and involved not one, but six personas. Six people who have a loyal and engaged audience, and really use and appreciate AmEx. These people were to share stories about AmEx being a part of their day-to-day life. The goal was to humanize the brand, make associations with real people and positive emotions, and promote the reward program #AmexPlatinum. And it worked! 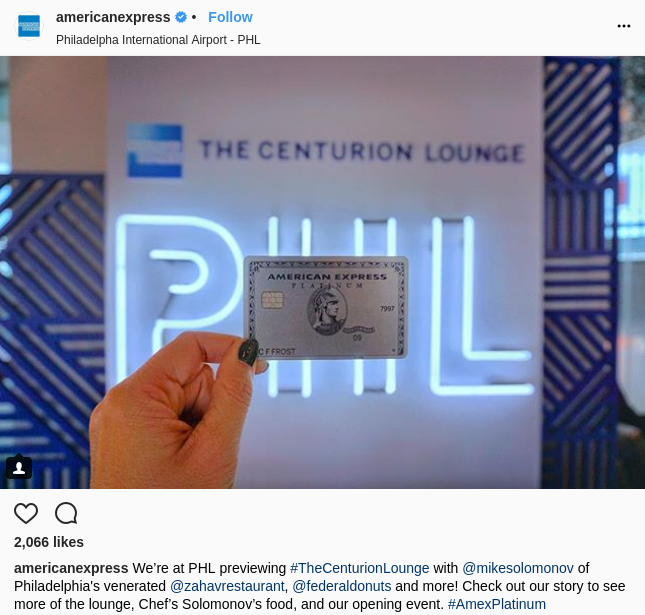 During the two weeks of the campaign, the influencers posted photos mentioning AmEx. To emphasize the luxury the influencers get access to with their platinum cards, the company hosted several events, which were covered in Instagram posts, of course. Centurion Lounges opening (premium lounge zones in airports), a visit to The Ice Museum in LA before it was opened to the public, and even tickets to a sold-out Broadway show. Anything to impress the followers with the life of rich and famous. AmEx Social Media VP, Mona Hamouly, shared her thought on the campaign a few months after the launch. She noted that the choice of influencers took the big part of the planning and strategizing. If you decide to follow AmEx example for your own brand, it makes sense to do some prior research as well. Choose people who are familiar with the brand, avoid controversial figures, and set clear expectations. This will allow you to leave the freedom of expression to the influencers, and help them stay open and honest with their audience. Video fruit provides software, coaching programs, and tools to help companies and entrepreneurs grow their email lists. Back in 2014 Bryan Harris, the owner, performed a test to see if guest blogging is really dead. The reason was a series of statements by Matt Cutts, former head of spam team at Google. There, he insisted that Google considers guest blogging links spammy. So Bryan decided to make a guest post on Okdork.com, and observe the results in traffic, exposure and lead generation. The guest post on acquiring the first 100 subscribers to your email base was more than 4,000 words long. 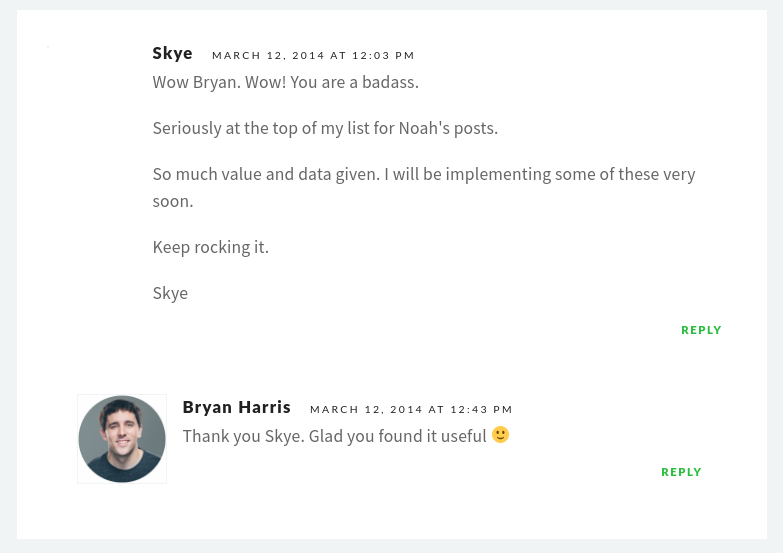 Bryan himself admitted that writing such a long post was a huge work, but it helped to make a profound analysis of the topic, and cover all the steps of building an email list. He had spent 20 hours crafting the post which was exhausting but paid off later with the exciting comments left by the readers. But writing and submitting the post wasn’t enough. To gain more opportunities for backlinks to his own site, Bryan actively participated in the comments section. As the result, 29 comments = 29 links = 29 more chances to be visited by the readers. So what did it take after all? Bryan insists that guest blogging is literally the best way to get first readers to your blog. But it’ll only work if the piece of guest post you write is truly awesome, revealing a profound knowledge of the topic and solving the most painful questions of the readers. This can be really tough if you don’t have an in-house writing team. This is the problem we often hear about from people coming to find guest posting services at Adsy. However, writing a meaningless post will change next to nothing, even if you manage to place it on the top-notch website. If this is your case, you may want to order content creation with its further placement to make sure to get a higher ROI. 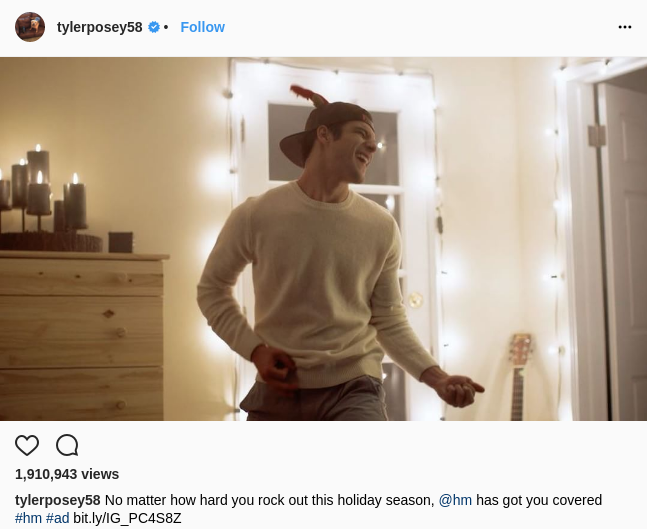 One more example of social media influencers’ impact is the holiday campaign by H&M. To draw attention to and increase sales of the new collection, the company invited 4 celebrities. Tyler Posey, Peyton List, Jana Kramer and Hannah Simone had to appeal to the audience aligning with the personality and general style of their profiles. When choosing its influencers H&M valued audience engagement more than the number of followers. The marketers of the company understand well that the reach without actual involvement and reaction will bring no results in sales. A curious fact is that for Peyton List and Jana Kramer the shorter version of the ad turned out to be more successful and efficient. For us marketers seeking ways to captivate viewers it’s a sign that even the shortest piece of content arouses strong emotions if it’s well-structured and positively charged. What social reaction did the company achieve? Splendid results, which would probably be much less impressive, if the company chose to address one single, though very powerful influencer. The example of AmEx already showed that the part of selecting influencers that will best represent the brand is the key part of any campaign, especially if we’re talking about social media. So instead of mapping out the whole scenario and giving the parts to “actors”, H&M chose a more natural approach as well. Letting the influencers follow their usual tone and angle turns any ad into a personal story that gets appreciated by the followers and engages them with your brand. Back to you now, have you ever used influencer marketing for your brand? If not, it’s time to try them! Start with ordering guest post article that will be written specifically for your brand and then placed on a relevant and appropriate website bringing you quality backlinks together with traffic and brand awareness boost.